Considering the Options | Daily decisions that change our lives. Have you ever had one of those conversations where you know the other person is not listening to what you are actually saying? It makes me think of the “discussions” I had with my parents when I was trying to convince them my plan was a good one. The whole while they are talking I’m thinking about another angle to my argument, another way I can state my case. For all I know they were agreeing with me. I have no idea because I’m completely engrossed in my argument and how to best present it. I’m much better at listening in a passionate conversation than when I was a teenager. But I still have plenty of room to grow. I’m more likely to catch myself now than I was then. My hope is someday I don’t have to catch myself. That listening to rebut is a thing of the past for me. It’s good to have goals right? Being passionate about an event, a topic or an issue is a good thing! We need people who are passionate and willing to put themselves out there. It’s how almost all change happens. Passion is good. There has been an abundance of passion this past week alone. People are excited and scared, anxious and fearful, hopeful and relieved. It is all over the board with such intensity and emotion. Listening is also good. Actually focusing on what someone is saying; their words their body language and their heart. (As an aside, remember, we aren’t all perfectly eloquent and certainly not all the time. Some times things come out all wrong. We phrase things in a way that can be interpreted differently. Considering the heart of the speaker helps avoid focusing on one phrase; getting stuck on semantics of a sentence.) Try really listening to understand what they are expressing. Hear what they are saying, not the clichés, not what you think they will say based on how you have categorized them, but what they are really sharing. Stephen Covey’s 5th habit of “7 Habits of Highly Effective People” is seek first to understand, then to be understood. It makes sense. If you want to connect with someone, you need to understand where they’re coming from. What motivates them, what drives their passion, how did they come to the view they have? All important details in really connecting. You can assume all day or you can really try to understand. You may find you can actually relate to and empathize with how they landed where they did. There are some great resources out there about active listening. You can find tools and tips to help you focus. In fact the Department of State website is a good place to start. This week’s assignment: Focus on understanding the person who disagrees with you. Spend time in conversation, real conversation, with someone with whom you disagree. Listen to their words, their body language, their heart. Remember they may not be the most eloquent. Try really listening to understand what they are expressing. From last week: There were certainly plenty of opportunities over the past week to look at how we categorize people. From political party to marches and even some football! How many times did you categorize someone else and make assumptions about them? Be honest. Did you catch yourself at all? It’s hard when you feel very passionate. We are all a work in progress. I’ve read a lot of comments on a lot of posts. Many of them are truly awful. Things people would never (or certainly should never) say to each other. On the other hand, there are a few of my friends who are very skilled at discussing issues without attacking individuals. I am learning from them. I thought it was about time to dust off the old blog and once again share my thoughts on everything, or at least on some things. When I started this blog nearly 7 years ago I was looking for an outlet. A way to share my thoughts and ideas. It became a bit of a journal of parenting. And then the kids got older, life got crazier (I didn’t think it could) and I embarked on a new role with a new organization. I decided to put the blog in storage for a while. I have been hesitant to put much out there knowing that, whether I intend it to or not, what I write becomes a reflection on the organization I work for. And I believe the world, and specifically the internet, has changed a lot in the last three years. It is a more divisive, angry place. I also know that writing is cathartic for me. It allows me to process what is happening around me and helps me to clarify my views. I could write and keep it to myself. Or I could share it and hope it helps someone else to process the world as well. Not to come to the same conclusions or opinions, but to think things through in a slightly different way. The title of the blog Considering the Options reflects my view on life, we always have options. Choices in how we react, respond or behave. So today, I am launching a series I hope will make an impact. I hope this will help those who know me or follow my blog to process the world around them. As I mentioned, these are my thoughts, my opinions. They are not the views of the people I work with or for, or the organizations of which I am a part. They are mine. The Connection Project – Why? I am lucky enough to have friends who see the world through very different filters than I. And I have very passionate friends. I have young friends, those the same age as my kids and friends who are enjoying the proverbial golden years. Friends from small towns and big cities, those who live close to where they grew up and those who live (or have lived) halfway around the world. I have friends who have chosen not to have children, and who are not able to have kids. Those who have adopted and fostered to adopt. Friends who gave birth to one and to many. Friends with children who look just like them and with children who are a different ethnicity. I have friends who have been married 50 plus years and who are newlyweds. And I have friends who never went down that path. I have gay friends and straight friends and some who are bisexual. I have friends who are doctors and lawyers and such (did you just sing that in your head like I did?). And I have friends who dropped out of school. I have friends who are farmers and railroaders, teachers and clergy. When you try to, you can categorize people in a million different ways. You can label them, assign them a trait. You can put them in a box based on that thing, that one piece of them you’ve chosen to identify. Many of these friends have expressed a desire to live in a more civil and compassionate world. Friends are concerned to varying degrees – from genuinely concerned to obsessively frightened. People are fearful of “what the world is coming to.” What kind of world our children and grandchildren will grow up in. People are certain the world is going to hell in a handbasket so to speak. I think every generation has had that feeling to some degree, but I do believe it is different today. So what can we do about it? How do we fix this world that’s falling apart? I am just one person and the problem is so big. I think the answer lies in connection. It lies in individual relationships. People connecting, one by one, with those around them. So today I am beginning a journey. A journey to share ideas for making this world a more palatable place. A place I will be excited to have my grandchildren live. I would love company on this journey! If you are brave enough to take a hard look at your role in this handbasket headed for hell:). This week’s assignment: Spend time thinking about all the ways you categorized the people around you. Be cognizant of when you put someone in a box; make assumptions about them based on one aspect of their life or personality. Recognize when you dismiss someone’s thoughts, opinions or views because of who you believe they are. Feel free to comment here and share your experience. I would love to hear how it goes this week! I survived. So far. I may or may not have cried the whole time they loaded the cars. I may or may not have cried half way there. I may or may not have cried most of the way home. I did not cry in the dorm. I helped him move with all the appearances of a sane mom. I didn’t sob while we were there. I only shed a tear as we said goodbye. It was a good day. It was easier than before because it is a familiar school and because Oldest Son and his wife were there with us to help him navigate. We’ve been to this place before, we know how to move into a dorm, we know what to take and how to pack and unpack. That was all good and easy. His room is “just like I imagined it would be” according to Youngest Son. It is ready to go, down to the pictures on the wall. We have never left a dorm with a kid that settled. And his roommate is a known. A good friend from high school who is also in band. In so many ways this is easier. The other two boys went potluck and we are 50/50 on how that turned out. Youngest Son is a step ahead with a fellow band member and friend. It was a really hard day. So much harder than before because this move carries so much more change than one kid moving. Just like the birth of our first son moved us into a new season in our life together, this youngest ushered us out of that season. In the course of a day, that transition we have seen on the horizon for a few years now happened. That thing that was looming, is. As we drove out of town, past the Konza Prairie with the lush rolling hills and vast skies, we saw the most breathtaking sunset. The intense colors, the movement of the clouds, the warmth of the sky were stunning. So symbolic of that season coming to a close in a blaze of glory like a God-painted sunset. It was beautiful and somewhat fleeting. I wanted to pause right there and soak it in. To hold onto it as long as I could. But sunsets are fleeting. No matter what you do, eventually the sky will turn black and the stars will be left. And then comes the darkness before the hope the next sunrise brings. It can seem like a long and daunting night. It is dark and cool and lonely. It feels empty and a bit crushing. I know the sun will rise again and it will be beautiful, when I am ready to notice it. The colors will be vibrant and the anticipation will lift my spirit, waiting, watching carefully to see the new day and all it has to bring. But the night, it’s hard. I am reminded of the time after my dad’s death. The sadness was overwhelming. And yet I was reminded many people have gone through the same thing. Some much younger than I, some much more traumatically, some much more painfully. My experience was not particularly unique. And yet it was the first time for me. It was the only time in my life I will lose my dad. Just as this is the only time in my life I will send my youngest off to his first college dorm. It is hard. It is raw and painful. And yet people do this all the time, and survive. I will too. My curiosity today is how do we allow ourselves to honor the sadness, accept the change, take time to grieve what used to be? I am truly grateful that I have had the opportunity to take my kids to college. That I have had the joy and honor of getting to walk with them into adulthood. I know not every parent gets to this point. I know they are on a great path and going to experience amazing things. They will each make a good difference in our world. I am excited for that! I look forward to seeing what they accomplish, where they go, who becomes center to their life. That is all good and right! It is also and right for Mom to take some time to experience the darkness of the night. To be in the place in between. It is OK to feel dark and sad and maybe a bit scared. My heart is tender right now. I feel like I should have some kind of warning beacon for those around me. Be gentle with me for a while, my heart is a bit beat up. I will be OK. Just give me some time to adjust to the quiet. There are times in your life when you realize, you are at a junction, a turning point. When life is about to change in big and irreversible ways. There is a certain sense that washes over you and makes you take pause and think deeply. The first time I remember this happening was when I got engaged. I was so excited, and yet realized life would never be the same. It was a good change and I was most definitely happy. But the truth was, life would change. That in between time of anticipation is rather daunting. The same thing happened as we neared the end of our first pregnancy. And our second. And our third. Life was about to change drastically. All joyous and happy changes, but yet a touch of mourning for the life that you are leaving behind. The freedom you had before children giving way to the joy of watching all their firsts. Wondering how you could possibly love another child as much as you do the first. (It is possible!) Never regret, but reflection, and a bit of sadness. Like the time between getting a contract on a house and closing. The in between can be brutal. The anticipation of what’s to come, the hint of second guessing choices, the excitement of the change. Then there is taking the last kid to college. All the same emotions, the fears, the anticipation, the reminiscing, the hope, the guilt, the confidence. As one of my favorite authors, Jen Hatmaker would say, “we have all the feels here” and then some. I find it interesting that an event can be so contradictory, so emotion filled. But it seems to be a theme in life and growth. There is much to look forward to – I have started my Empty Nest Year 1 Bucket List. I can’t wait to do all the things on that list. (I might even add -Get back to blogging – to that list!) Things we have put off doing for years or just weren’t an option when the kids were home. We have plans to attend lots of College marching band performances (aka football games). We have a trip planned and are working on a girls weekend, and couples weekend away with friends. It is exciting and freeing and going to be so much fun! We’ve put in a lot of hard work to get here. We did our parenting job and so far it appears we did a decent job. (The proof of good parenting is not immediate- it’s really a bit of a crap shoot. You do what you think is right and years later get glimpses of what worked and what missed the mark or was completely forgotten.) This is our time. Our chance to remember who we were as a couple. Way back in the day. And figure out who we are together today, sans kids. It is good! And yet there is the hint of melancholy, the tear just about to fall. It has been 22 years since we have lived alone together. By far, most of our adult lives we have had these men in our home. We loved the noise, the chaos, the tension and laughter. We were good as a family, together, every day. I’m going to miss those interactions. I will miss hearing about their day, knowing their schedules and daily activities. Hearing about who they are spending their days with. It is right and good. They are supposed to leave home. I get that. They will be fine. We will be fine. I will be fine. But this is another one of those moments when I stand on the precipice of change. Change I asked for (‘cause who wants their kids to live at home forever?! ), but change none the less. Tomorrow will be a sad day. And a happy day. I will cry. Maybe a lot. And I will laugh, definitely a lot. I think it is the right thing to do to honor all those feelings. To embrace the sadness and let the tears roll. To laugh together and make our own plans to fill the free time we are about to have. And hey, we have kittens so that’s almost the same, right? Post Script: After I wrote this, I got to thinking about when Oldest Son left for college. I remember sobbing as I wrote. It was so hard. I went back and read the post. Made me tear up again and laugh too. Second Son’s departure was indeed as painful or more so than Oldest. I just couldn’t write during that time. I can tell you in a couple of days if Youngest Son’s truly was easier or not. Yes, I deserve some kind of grace for having this much change in less than a month! And wine. I deserve wine! So the challenge for me becomes; ignore it and leave others to figure it out or dig in and try to better understand the issue. Ignoring it is easier, and frankly the route I sometimes (maybe often) take. There are times I just choose not to try to understand something so complex. I focus my energy on my family, my work and my own To Do list. Other times I spend (likely too much) time trying to understand. Reading articles, looking at the source of information, trying to understand the context and the greater circumstances and ramifications. I am lucky to have really smart friends with really diverse views who share links to a lot of information sources. I love reading different viewpoints! As I said, I have had a lot of questions about the Syrian Refugee issue. Below are a couple of my questions along with those I have heard from friends and family and some sources I found helpful in better understanding the situation. Maybe they will be helpful to you as well. What is the current vetting process for refugees coming to the US? You may have seen a Facebook post by attorney Scott Hicks. I didn’t share it because I had no idea if it was legit. I did a little research and he appears to be real and have personal experience in navigating the refugee process. Here is an article on Patheos that includes the text of his post. If the vetting process takes so long, how do we already have refugees arriving in the US? This civil war began back in 2011 – 4 1/2 years ago. To date more than 250,000 people have been killed and more than 4 million have fled the country. This article gives a good synopsis of the conflict. Why not settle them closer to home; the Middle East, North Africa or Eastern Europe? They have. Four million people have fled that country. Nearly 2 million have been taken in by Turkey to date. Other countries in the region (Lebanon, Jordon, Iraq, Egypt and North Africa) have taken in another 2 million. That same article has some good graphics to show where refugees have been going. If Daesh/ISIS/ISIL isn’t “true” Islam, why aren’t Muslims speaking out against it? They are, we just aren’t reading/listening to them. Muslim leaders all over the world are denouncing these extremist groups. Here are a few of the dozens of articles; leaders, social media, average people and this list of many articles. What does Islam teach and why are extremists able to hijack that religion? This one is giant and I’ve spent more than a couple hours already today. See what I mean, it takes time to understand the issues! I do know the ‘crazies’ can hijack any religion (think Westboro – not my Christianity!) I’ve got a lot to learn about Islam. I’m going to start with an open mind and these three sources. I also wonder what I can do to be helpful to the refugees? Where can I make an impact? I’ll have to tackle that research another day. I would love to hear where you go for information! What sources have you found to be quick, concise and balanced? After all, I have a family, work and my To Do list awaits even when the world is in crisis. Help me be informed on a time budget:). I’m challenged by the Syrian refugee issue. I don’t know the right answer. On one hand, I feel compassionate to people who live in a horrible place, made that way by war. I don’t believe people deserve to live that way and I don’t believe the majority of them have the power or capacity to change their country/region. As a human and a person of faith, I am called to help, to be compassionate and caring. On the other hand, as a thinking person living in a free country with a culture vastly different from where this war is taking place, I feel cautious. We have seen many examples of the hate manifested in attacks on innocent people. People who did nothing to deserve it. I feel the need to protect my family, my home and my way of life. I think that’s fair on my part. How then do I reconcile the two? How does one show compassion for hurting people and at the same time provide safety and security for their own family? I really would like to hear how others have resolved this conflict personally. My thoughts – First, I think you have to identify if it’s a real threat. Is it the kind of “perceived threat” we feel when we see someone who looks different from us? Or the real threat of someone who likely intends to do harm? I think in this case it’s both. There are desperate people who need help. They need the basics of food, shelter and safety. And among them there are people who are evil. People who will use our compassion against us. People who will give up their own lives to hurt us. Both are real. It seems this issue is like every other; there are only extremes. My feed is filled with calls to reject all refugees or risk death, to close the borders quickly. And with claims of willingness to open their own homes to refugees, to let them all come. Either you believe the refugees are a threat which makes you a heartless, cruel Christian who picks and chooses when to follow your faith. Or you think we should open the doors wide and welcome everyone in which makes you naïve and willing to risk the freedoms our forefathers fought to gain. People who are against bringing refugees to this country forget what our ancestors went through to get here. People willing to bring refugees to this country forget the danger and evil that exist in the world. There is no in between. Is bringing refugees to our home, our country the only way to help them? Is there another solution that is somewhere in between? It seems like if we take a breath, step back a moment, we can come up with a solution that cares for those in need and maintains some level of security for this country. (Ya, I know, I’m living in a fantasy world to think anywhere is safe!) At the very least is there a place for conversation without name calling? Is there a place for an intelligent, thoughtful conversation without resorting to hyperbole and extremism? Can we articulate our ideas and opinions with our own words rather than an exaggerated meme? Is it possible to hear someone else’s thoughts and opinions and validate their concerns? Is it so risky to acknowledge that you can understand where someone else is coming from? Or must we shut down and label those who might see the world differently? Is there a place for a real conversation? I don’t know if that exists anymore. I shared in my last couple posts about my healthy lifestyle changes. I told you my Hubby joined the gym with me. He has been using the same journaling app that I have and has been just as committed as me at making changes. I thought it might be fun to share some of the ups and downs of losing weight as a couple – good bad and sometimes ugly. I can’t imagine trying to do this without the support of my spouse. I hear of people who prepare separate meals for their family while they are “dieting” or trying to lose weight. I have to ask myself, why isn’t what you are eating appropriate for your family? I just couldn’t do that so I’m thankful I don’t have to. Having someone to workout with really helped me get started and be consistent! I really felt like that first month was critical to long-term success. For me, creating that “habit” of daily workout was so important. We started during Christmas break when I wasn’t working. This made it easy to fit in and I could be super flexible. This meant there was no reason not to go every day. And then when I did go back to work after that first week, we didn’t have much in the way of evening activities. That meant I worked out 27 days in January. Definitely set a precedent for myself. I don’t know if I would have pulled that off without him! I also have friends who belong to the same gym and love meeting up with them to mix up my workout. It’s great to try a new class with a buddy or teach each other new strength techniques. We do hold each other accountable…in a good way. After 20+ years we have a pretty good idea of when to push and when to get out of the way:). We both have the expectation of working out 5-6 times a week, it’s just a matter of when. Sometimes together and sometimes not. But there is a downside as well. Hubby is 6′ tall. I am 5’5″. When we started, he weighed .6 pound more than me. Hard pill for me to swallow. Then there’s the part where men seem to lose weight more quickly than women. Or as I describe it, “He can look at a salad and lose 5 pounds! Not gonna lie, this was really frustrating in the beginning. By my dear Hubby knew that. He didn’t talk much about where he is or what he has lost. When I was struggling to bump past a plateau at 12 pounds, Youngest Son asked if I knew how much Hubby has lost. I had no idea. He was at 16 pounds down and didn’t share it with me because he knew I was struggling. Isn’t that kind?! I thought so. Right after a punched him a little:). There’s a bit of healthy competition as well. How many minutes on the elliptical? What incline on the treadmill? How many reps? I think it all keeps us pushing ourselves to give it our all. We also approach the results of our weight loss differently. He hasn’t bought one new piece of clothing. 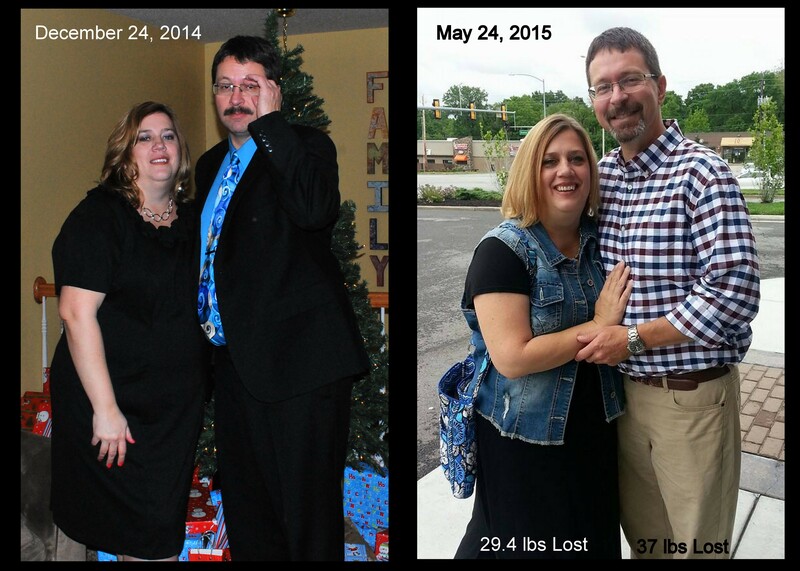 When he was down 21 pounds he was still wearing the same clothes. Can you say baggy pants?! I, on the other hand, am enjoying trying on new sizes. And I’ve pulled a couple of items out of my doesn’t-fit-me-anymore bin. I have given myself incentives/rewards at 10 and 15 pounds lost, then just started buying clothes…a lot. That doesn’t motivate him. Over the last 2 months some things have become more challenging. End of school year activities have ramped up making it harder to fit in exercise. We’ve had more celebrations with food that require planning ahead and making good choices. We have realized that choosing to be healthy and incorporate regular exercise requires being a bit selfish. I have to make time to go to the gym when I can and sometimes that means not going to an event or not being home for dinner until later. You really have to choose to make time for it and that means not using that time for something else. We are exercising separately much more often not. It’s been rare for us to go to the gym together lately. Middle Son is home from college and goes with one of us part of the time. It helps having someone else there. Hubby is still ahead of me on the weight loss. He still hasn’t bought clothes (I’ve bought him a few things and he’s pulled some out of the old doesn’t fit anymore boxes.) I’m a little more OK with it than I was in the beginning. I know I’m in this for the long haul. I have a lot more weight to lose, but feel good about the permanent changes I’ve made. Recently, I had about a 2 week hiatus from recording what I ate. Between travel and busy schedules, I just chose to take a break. I exercised less, but tried to make sure I snuck in a little more activity when I could. It resulted in a 1.6 lb loss. That tells me I’ve made some permanent lifestyle changes! I’m back in the swing and mixing things up a bit – some running, more core work and trying hard to get my arms ready for sleeveless shirts:). Here is a 5 month pic comparison of us. When I saw these two together – wow! I can see the difference. Feels good! As it says, I am down 29.4 (there is another massage waiting for me at 30- come on 30!!) and he is down 37! My BMI is down 4.4 (still in the obese category). I’ve lost 7.5″ off my bust, 6.25″ off my waist, 5″ off my hips, 1.5″ off my neck and 3″ off my quads. Making progress. Want to know when I've posted something new? Enter your email and I'll send my next inspiring prose right to your inbox!email you when I write something inspiring! Thanks for stopping by - I hope you find a little bit of humor, something you can relate to. Life is crazy and we have so much to learn from each other! My blog is about sharing a little bit of my life; wife, mom to 3 teenage boys, career, and I may even offer a little unsolicited advice now and then for good measure. I have lots of opinions and I'm usually pretty quick to share! My Blog is Considering the Options because I think we face dozens of choices each day that give us opportunities to change our lives...and most of the time we don't even realize it. Sit back with the drink of your choice and take a peek into my world. Have a question? Looking for a photographer? Contact me at perspectivesbyJudy at gmail dot com. Considering the Options · Daily decisions that change our lives.